This latest puzzle book from BRF contains 80 word searches, covering a wide variety of Bible-based themes from 'Fruit, vegetables and nuts found in the Bible' to a mini-series of searches covering the events of Christmas. 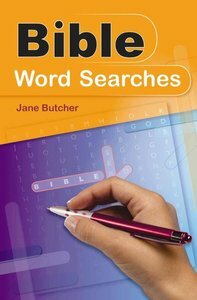 This title includes 80 brand-new Bible-based word searches ranging from simple to more complex. It builds on the success of BRF's other puzzle books. It is suitable for "Three Down", "Nine Across" and "Quick Bible Crosswords" readers. It is also suitable as an excellent gift for Christians who like puzzle books. It could also be used as fun small group/youthwork resource. Author is a keen puzzle-solver and also is a member of BRF's Barnabas team. It is also suitable for: Christians who like puzzle books - from late teens upwards; those who bought "Three Down, Nine Across and Quick Bible Crosswords"; those wanting imaginative resource for small group/youthwork; and, those looking for a fun gift or stocking filler. It includes short introduction followed by 80 word searches. It covers a wide variety of Bible-based themes from 'fruit, vegetables and nuts found in the Bible' to mini-series of searches covering the events of Christmas and Easter. The words can be hidden horizontally, vertically or diagonally. Some are written forwards while others may be backwards. The level of challenge ranges from quick and easy to brain-baffling. Solutions are provided at the back of the book, but for the hardest searches the reader has to work out which words are included!